It’s an airy white scarf splashed with artistic water drops, and it has a rather prominent swachh worked in. Its blue tassels are detachable so they can be tied around your wrist like a good luck charm. And the profit from its sales go towards providing safe drinking water in India. Are you thinking, ‘water’ idea? The brain behind the scarf, Jacqueline Lundquist, is a woman who’s never short of plans or the determination to see them brought to fruition. The scarf is one of her latest ideas connected to her role as VP of Corporate Affairs and Chief Serendipity Officer at WaterHealth International, an American organisation that provides safe drinking water to underserved communities in over 500 locations across the world. “We provide the single best-quality drinking water for the lowest price in the world. And we say that with total confidence,” she claims. Her political awareness and networking savvy are equally formidable. 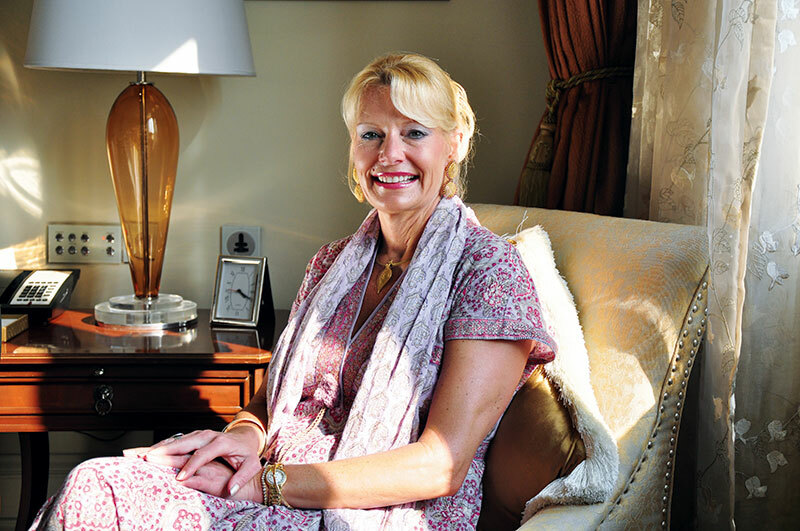 Lundquist can go from tipping her hat to Narendra Modi’s Swachh Bharat campaign to fundraising for Hillary Clinton without missing a beat or a smile. When we meet, she has just flown to Mumbai after hosting a fundraising dinner for Clinton in her hometown of Colorado Springs in the US. The presidential aspirant wasn’t there but her husband Bill was; the former president is an old friend of Lundquist and her husband Richard Celeste, who had a high-profile stint as US Ambassador to India from 1998 to 2001. So how is Dr Water (the brand under which WaterHealth retails) different from the water dispensed by the various other water-purifying companies available in India? “For those machines, you need to have water that is of a certain level of cleanliness to begin with. But we can purify sewage water up to WHO standards,” she says. The price? Rupees five to 10 for a 20-litre can. Cheap by international standards, but not perhaps for poor rural families. “We’re aware of that,” she says. “That’s why we charge only rupees five in the slums.” So how does WaterHealth work? Once they have identified a community that is in need of safe drinking water, says its Chief Serendipity Officer, they talk to the panchayats or local leaders to allow access to the water source. “The land is theirs, the water is theirs; it’s not in our books as an asset,” she clarifies. Each WaterHealth centre costs approximately rupees 20 lakhs, money that comes from “private donors, Rotary groups around the world, USAID, the Dutch government, the Tata Trusts and other companies in India”. Locals, who are trained by them, enter into a contract with WaterHealth to run the centre for 25 years. “Which means we are not going to leave the community for that time,” says Lundquist. “After that, we hand over the plant to them. Or they can renew the contract.” WaterHealth currently operates in Andhra Pradesh, but Lundquist says they will soon be putting up 198 centres in Bengaluru and 60 in New Delhi, which will also have another 235 distribution points. She is also involved with Jaldhaara Foundation, which works to create awareness about safe drinking water and hygiene practices. For its launch in Andhra Pradesh in January 2014, Lundquist roped in a host of celebrities including Jon Cryer, who played the beleaguered Alan Harper in the long-running American sitcom Two and a Half Men. On the Indian side, she had the then Commerce and Industry minister, Anand Sharma, and actors Dia Mirza and Jackie Shroff, among others. She’s using those smooth networking skills for another one of her ideas — a personalised annual India tour for well-heeled travellers, having taken up to 64 guests at a time. The price? 16,000 dollars for a 15-day trip this year. The best part? The fees include a 2,500-dollar donation to WaterHealth International. But that trip will happen only after we know if Hillary Clinton will become the first woman to hold what’s considered the world’s top job. If she does, it will be a big moment in world history and Jacqueline Lundquist plans to be there. “Hillary is a remarkable woman. And nobody has been better prepared for the job than she has. She was an extraordinary Secretary of State, she has been in the Senate, she knows how to work across the aisle,” she says. And of course, she has an ex-president to advise her. If all goes well for the Clintons, Lundquist might well be back in India, and not merely to herd a bunch of tourists on the luxury trail. If things don’t pan out that way, she’ll still be back — you can’t keep her away from India for too long.